One of Folly's Best! Laplaya is a clean and comfortable 1 bedroom condo with hardwood floors throughout and a new king size tempurpedic mattress that makes sleeping heavenly in this oceanfront condo. It's located on the first floor of a three story elevated complex that sits directly on the beach. Wake up to enjoy the beautiful beach sunrise from your own balcony or relax on the porch and enjoy the warm sunshine watching the dolphins play while sipping your morning coffee. The night sky is perfect for stargazing while listening to the waves crash onto the shore. You even have full access to a shared washer/dryer during your vacation too! You can park your car in your own private parking space the entire time you are here because everything is within easy walking distance. A few words from the owner....... My wife and I like to enjoy our condo often. Rest assured you will find our condo clean and comfortable with nice furnishings and a fully equipped kitchen. I strive to have one of the nicest condos in the building. Our goal is to have every guest return for their next vacation. Beach lovers can enjoy the beach from the front balcony or by crossing our private boardwalk over the sand dunes right onto the sand. 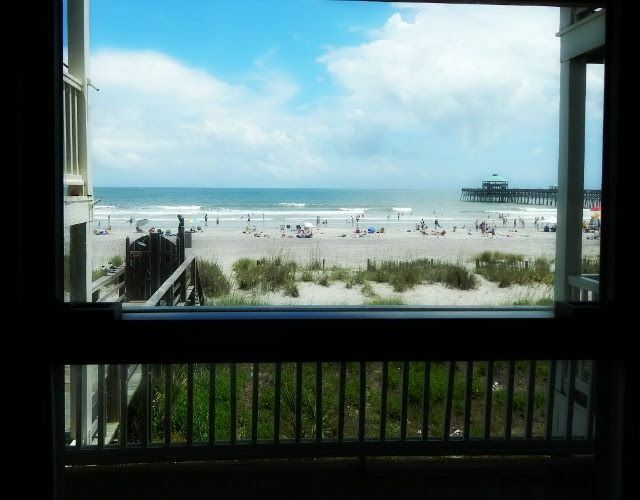 Those who enjoy the ocean will love the view directly in front of the condo. During the summer enjoy the water at one of the only sections of beach with a lifeguard. Those that like to fish can walk less than a block to the Fishing Pier to join other anglers working these very productive spots. Great restaurants, fresh seafood vendors and a grocery store are all nearby. This unit is a great base to explore the beach and the Historic City of Charleston as well. Well behaved dogs are allowed only with approval and paid pet fee. We will need the breed and size of your pet prior to approval. This rental includes 1 reserved parking space. You will have your own private parking space for your stay. All photos are current and accurately depict the property. Please book with confidence. This property is licensed by city of Folly Beach as a vacation rental - License Number LIC-1-19-200274. Because of the potential of fraud, we would not recommend booking a property through Craigslist or a property not licensed by the city of Folly Beach as a vacation rental. I grew up surfing on Folly Beach and always wanted to have a place there. We use it whenever we can. The view is amazing. Our condo is located directly on the beach near the pier. Surfing, fishing and the ability to park your car for the entire stay and still be able to eat out and enjoy the full Edge of America experience are a few of the wonderful benefits. Everything you need is a short walk away. Beautiful and convenient location! It was too cold to go outside for part of our trip, but we enjoyed being inside with the amazing view. We got a take and bake pizza from Berts and enjoyed lunch in the room while watching the surfers. The walk to the beach and all area restaurants and shops was very convenient! Great vacation get away! Space was perfect for my husband and I and our 5 year old daughter. Comfortable stay. Great location. There was a remodel in our original rental and the staff did a fantastic job accommodating us in another unit until the project was complete. Very nice property. Beautiful view! Very nice condo. Beautiful view. Well maintained. Very nice one bedroom condo directly on the beach and an easy 2 block walk to all the restaurants and shops on Center Street. Be aware that Folly Beach, and this property in particular, is VERY dog-friendly. We might have been the only ones in the building without a dog! The condo was very clean, but I did have to take allergy medicine while there, due to mild allergies to dogs. The condo itself is a bit worn but, again, very clean and everything worked well. It was perfect for a week for a couple. Will definitely consider it again when we return to Folly in the future. We have stayed at LaPlaya for 4 years now. Love the beachfront location which is close to downtown as well. Everything we need to make a 'home away from home". Very nice property. Beautifully decorated. All the comforts of home. Nice and clean. Beautiful beach and within walking distance of anything we wanted to do. My only complaint is that the unit was too warm for me to sleep well in the bedroom at night. And the sofa bed in the living room where it was coolest, was very uncomfortable. Pet Fee of $25 per day per pet plus tax added after pet approval by our office.